21 February 2018 – Today, Bahrain’s Military High Court of Appeal rejected the appeal of three civilians and one soldier convicted in a mass trial – “Terror Case/2017/1” – by the Military High Court on 25 December 2017. The case marks the first trial of civilians before a military tribunal in Bahrain since the 2011 National Safety Courts, following the king’s April 2017 decision to amend the constitution and expand the jurisdiction of the military judiciary. The use of military courts to try civilians violates international fair trial standards and represents an egregious contravention of Bahrain’s reform obligations under the Bahrain Independent Commission of Inquiry (BICI) and the United Nations Universal Periodic Review (UPR) process. 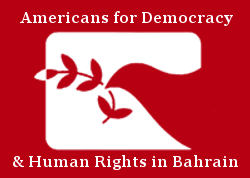 Americans for Democracy & Human Rights in Bahrain (ADHRB) condemns today’s ruling and calls for all of the defendants to be released. The government must immediately vacate the sentences, restore the constitutional prohibition on military trials for civilians, and ensure that any further legal proceedings occur in civilian courts abiding by all fair trial norms. On 25 December 2017, the Bahraini Military High Court Bahrain tried 18 men (17 civilians and one soldier) on charges of forming a terrorist cell and plotting to assassinate the commander of the Bahrain Defence Force (BDF), Bahrain’s military. The court sentenced six men – Sayed Fadhel Abbas Hassan Radhi, Sayed Alawi Sayed Husain Alawi, Mohammed Abdulhassan Al Mutagahwi, Murtada Majeed Ramadan Alawi, Habeeb Abdullah Hassan Ali, and the one soldier, Mubarak Adel Mubarak Mahanna – to death with an additional 15-year prison term, and seven men to seven-year prison terms. It acquitted five of the defendants. The 13 men who were convicted were also stripped of their nationality. Today, after appeal hearings on 10, 14, and 31 January 2018, the military rejected appeals from Mubarak Adel Mubarak Mahanna, Sayed Fadhel Abbas Hassan Radhi, Sayed Alawi Sayed Husain Alawi, and Mohammed Abdulhassan Al Mutagahwi, confirming their death sentences and prison terms. They may now challenge the ruling at the BDF’s highest court: the Military Court of Cassation. Additionally, the Military High Court of Appeal rejected an appeal from the Military Prosecution that sought to overturn the five acquittals, and suspended another appeal from the Military Prosecution to alter the in absentia verdict of five defendants who are not in government custody. The court accepted the appeal of two defendants – Hussain Mohammed Ahmed Shehab and Mohammed Yussef Marhoon Al Ajmi – and reduced their prison terms from seven years to five, but rejected a similar appeal from two other defendants – Mohammed Abdul Hussain Saleh Al Shihabi and Mohammed Abdel Wahed Mohamed El Najjar – confirming their seven-year sentences. The military upheld the denaturalization rulings for all of the 13 convicted defendants. The case represents the first BDF trial of civilians since the king removed the constitutional prohibition on such proceedings in April 2017, following approval from both the elected and appointed houses of the National Assembly. In 2011, similar security tribunals were established to hear cases arising out of the pro-democracy protests, known as National Safety Courts (NSC) in reference to the State of National Safety declared by the king. The NSC were noted for due process violations, a lack of transparency, and judicial irregularities, including the acceptance of forced testimony extracted through torture. After the 2011 protests, the government disbanded the NSC and maintained the constitutional provision restricting the standard military judiciary from trying civilians. However, the 2017 amendment to the constitution eliminated this provision and allowed the BDF to try civilians in cases deemed to impact national security, even without the declaration of a State of National Safety or Martial Law. The king’s decision effectively renders the emergency measure of NSC trials a normal part of the justice system in Bahrain, and directly incorporates the military further into civilian governance. The use of military courts to try civilians is in violation of the fair trial rights enshrined in both the Universal Declaration of Human Rights (Article 10) and the International Covenant for Civil and Political Rights (Article 14). In addition, it contravenes the spirit of the BICI recommendations, which stated in Recommendation 1720 that “fundamental principles of a fair trial, including prompt and full access to legal counsel and inadmissibility of coerced testimony, were not respected” in the NSC, and that the cases should be subject to civilian review. The government’s actions also explicitly violate recommendations that Bahrain accepted as part of its UPR process, which variably called on the authorities to ensure that civilians are never again tried in military courts. Aggravating the use of a military court, both the initial and appeal proceedings have been rife with other due process and human rights violations. Several defendants report that officials tortured them to extract confessions, and some – like Sayed Alawi and Sayed Fadhel – were subjected to enforced disappearance and incommunicado detention. Eight defendants were convicted in absentia, as they had reportedly fled to Iraq and Iran, and at least two were minors at the time of the alleged offense or arrest. The court additionally “issued a decision banning the publication of any information, data or news by any audio-visual, electronic or written media.” In the initial trial, the authorities prevented some defendants from meeting with a lawyer until the third hearing in November 2017, and the court has rejected the defense’s request to re-examine suspects and question anonymous witnesses during the appeal. On the 31 January appeal hearing, sources report that the defendants were not allowed to speak, despite prior assurances from the judge. The military’s greater involvement in domestic repression comes at a time when Bahrain’s leading defense partner, the United States (US), is deepening security cooperation. Eight-five percent of the BDF’s armaments are already estimated to be American-made, and in March 2017, just as Bahrain’s parliament was pushing through the constitutional amendment, the Trump Administration signaled it would drop all remaining restrictions on a multi-billion-dollar arms sale to the kingdom, which it authorized later that year. Since 2015, the US government has justified resuming arms transfers to the Bahraini military because the BDF and the National Guard had been removed from domestic policing. However, the BDF has now directly returned to a role in law enforcement, and some of the defendants report being detained and even tortured by BDF personnel, in BDF facilities. This compounds the Bahraini military’s longstanding problems of sectarian discrimination and extremism, documented by ADHRB, as well as its increased control over the public healthcare system. ADHRB reiterates our condemnation of Bahrain’s unfair military trials and calls upon the Bahraini government to void the verdicts, repeal the constitutional amendment, and release the detainees. The government must further cease its imposition of punitive denaturalization and institute an immediate moratorium on the death penalty with a view toward abolishing capital punishment. Lastly, ADHRB calls on Bahrain’s leading military partners – and particularly the US – to suspend all security assistance and cooperation with the BDF until such time as it is no longer empowered to try civilians and has been investigated for its involvement in severe human rights abuses such as torture.